This young family contacted Nicholson Landscape through our Facebook page. 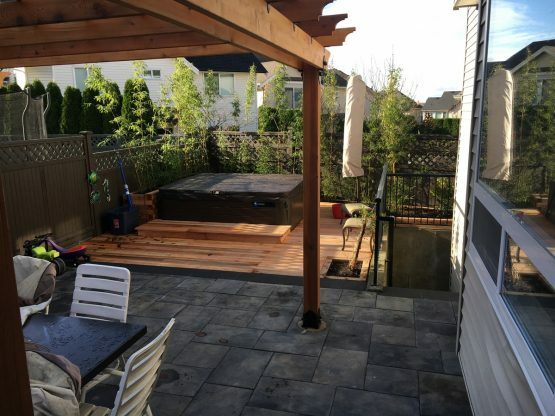 I have known the woman for many years and was more than happy she thought about us when redesigning their small back yard. 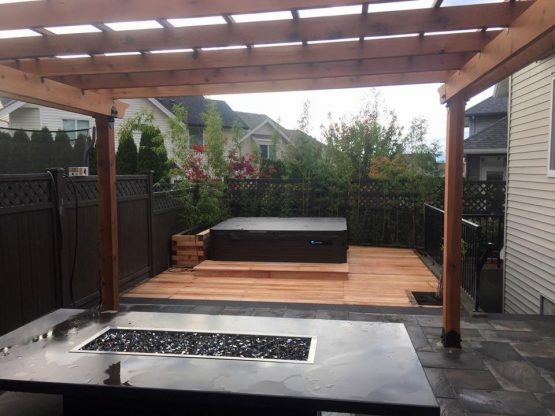 The focus was a raised deck around a new hot tub. 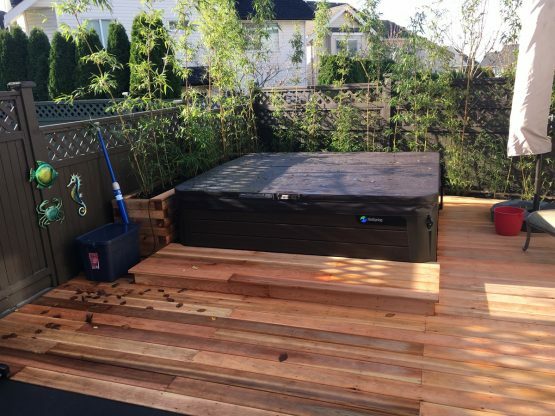 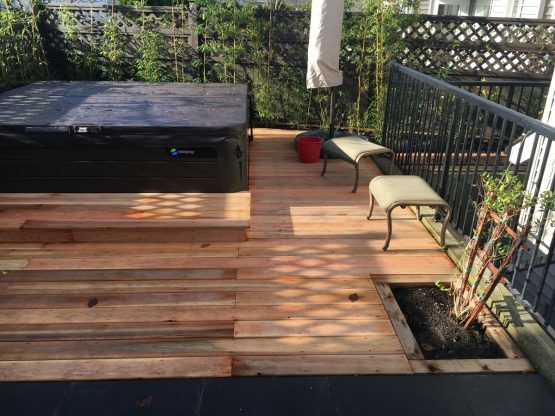 We installed a paving slab base for the hot tub and used the natural elevation differences in the yard to build the hot tub submerged inside a deck. The deck is built from high grade cedar. 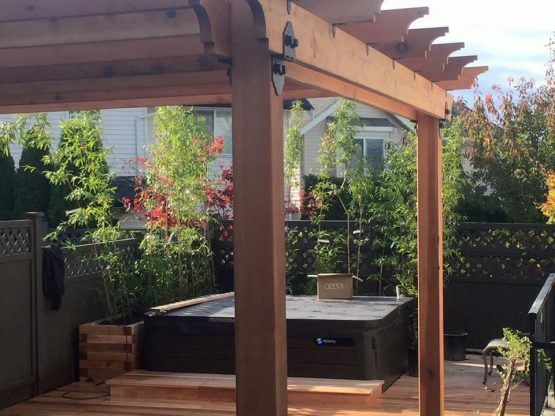 They wanted privacy around the hut tub so we installed raised planters made from high grade cedar with mature 10 foot tall bamboo to give them immediate privacy. The second wish was a covered pergola. We built and stained the pergola at the shop and assembled it on site on concrete footings using Lee Valley hardware. We later sub contracted the installation of a glass cover using a glass glazing company. 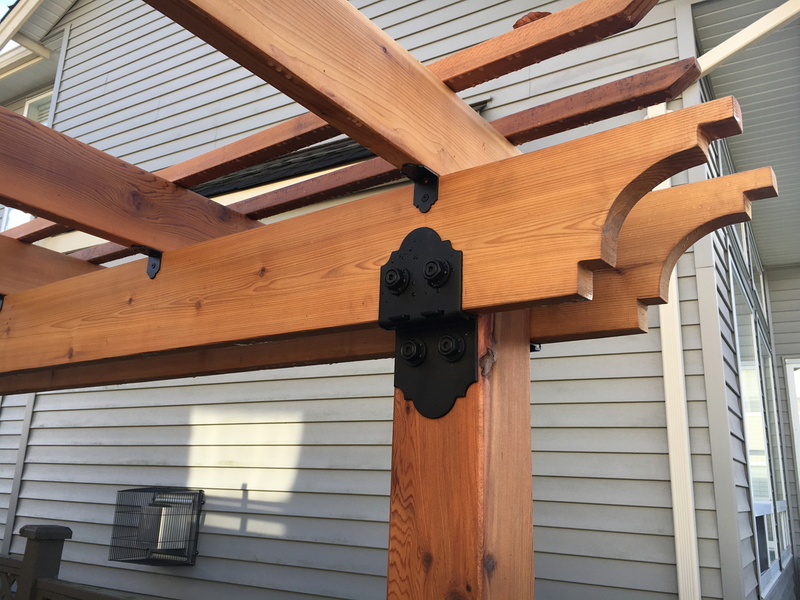 The client sent us a picture of the heavy snow on top of the pergola and was very pleased to see the structure handling the extra weight without issues. After demoing the old concrete patio and stairs we installed paving slabs from Barkman and stairs from Abbotsford Concrete. 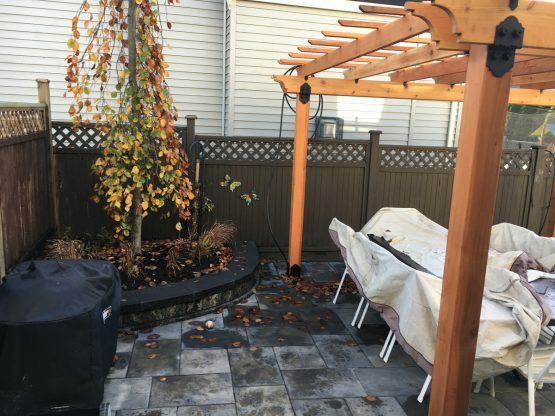 Under this patio was installed a gas line for the barbecue and out door lighting wires. 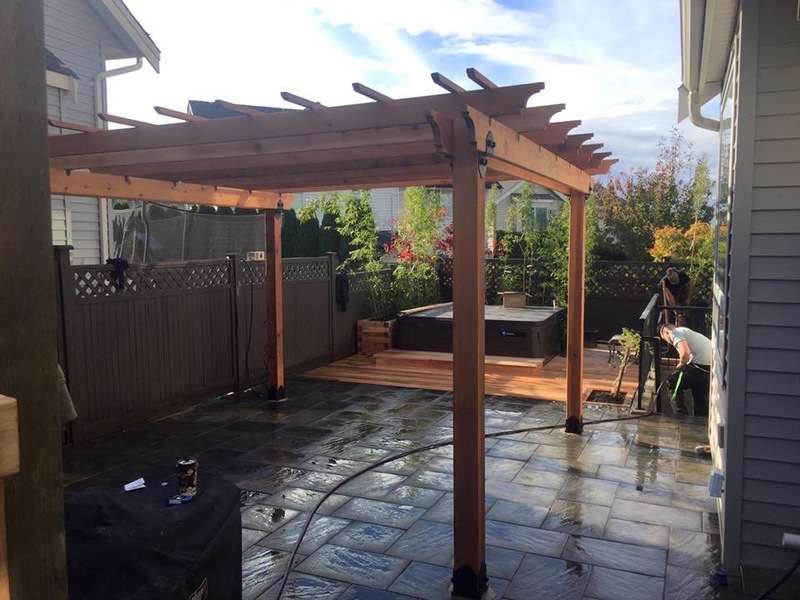 We lit up the pergola and installed some lights on the old fence to give the new out door space ambient lighting. 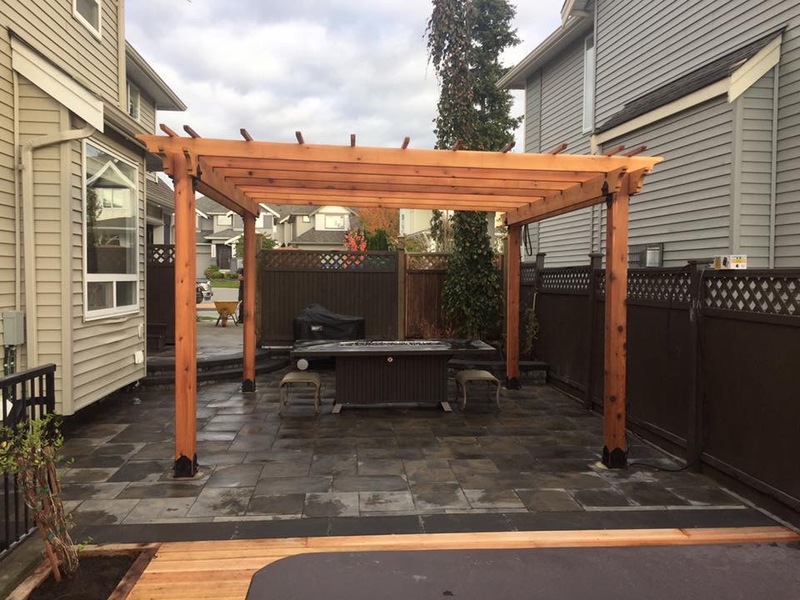 Overall is was a pleasure working with this young family and we are fortunate enough to have many other landscape renovations jobs in this North Surrey neighborhood as they loving showing their neighbors our work.